I’m slightly bothered by something, not because it’s bad, but because it’s weird. And I’m writing this because although it’s likely that it’s happened to others, it’s rather unlikely that anyone else has opened up about it before. A warning to those of a delicate disposition, this post may “squick you out”, to the rest of you, I’m doing this for science. You would mostly be aware (via posts here) that I had bowel cancer, had the tumor removed, and had follow-up treatments. You are also quite likely to be aware that I had an ileostomy, a bag, sort of like a colostomy, which was temporary (I had it for five years), which was finally removed a couple of years ago. Well here’s the awkward truth. My farts and indeed my poo, often, not always, but often, smells like a mix of coffee, chocolate and biscuits. That’s right, poo is supposed to smell bad, it’s supposed to smell… like poo. It’s not all the time, sometimes things do smell terrible, but often I leave the lavatory leaving the room smelling something like coffee and chocolate. I had wondered, had I simply become used to how utterly awful the ileostomy output was? believe me, you haven’t lived until you’ve smelt the contents of those things. “putrid” is the right word. Poo would come in at about six points on the stench-o-meter, but ileostomy waste is a good ten. But then I had it for five years, so perhaps I simply got used to it. I have noticed this sweet smell quite a lot recently, I wonder what it is? Also, I do not live on coffee and chocolate, I have two cups a day at most. Whatever happened to Gloria Jean? 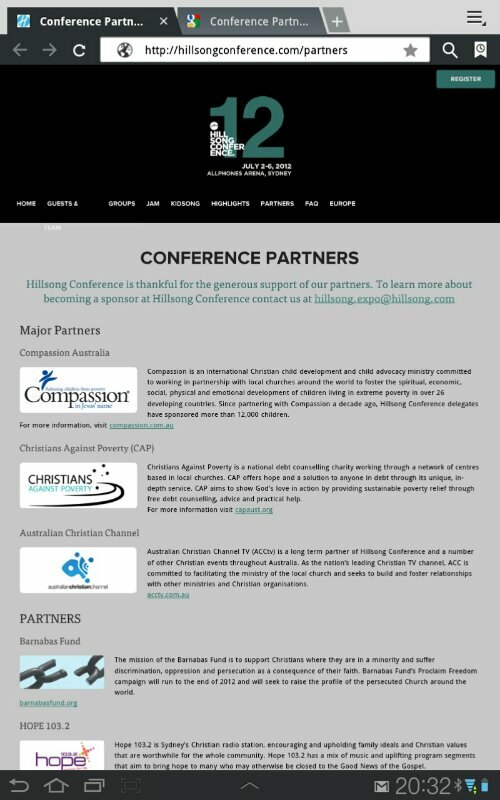 Hillsong Conference is a massive fundie meeting run annually by the controversial Hillsong cult. This year, it’s at the Allphones Arena and it costs a mere $279 to attend. A church service at such a bargain basement price clearly needs very generous sponsors to help it scrape by. 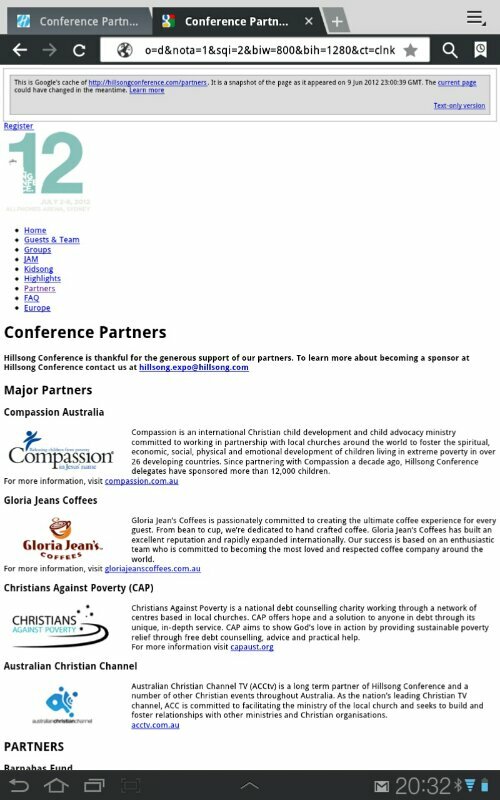 Seems like some kind of glitch has scrubbed all mention of Gloria Jean’s coffee from poor Hillsong’s website! Good job I was able to preserve it. After all, Gloria Jeans’s generous contribution to the rabidly anti-gay group might have gone unnoticed! I’m sure it’s a pure coincidence that this dreadful glitch happened the day after Gloria Jeans was embarrassingly revealed to be funding another notorious gay-hate group. Today I met @I_Enigma from twitter in “Real Life” (Hate that term). We met at a cafe in Seddon, called Le Chein (The Dog), which was appropriate because I had Katie with me. It was just a little bit wet and although we had cover, I was copping a little bit of fine rain, but it wasn’t enough to put me off. food and just general stuff, and of course Katie, Who approved of Ms Enigma quite a lot. To be honest, I didn’t feel hungry, and decided to just have a coffee and not have food with it, I’m a night owl, and I’d only had breakfast a mere two hours earlier. Ms Enigma decided to have a poached chicken salad, which did look great… So after seeing hers, I ordered one too. Katie naturally had a few bits of chicken. After we’d had lunch we walked to the corner and started a chat with the woman who runs Diamond Dog, a secondhand shop which the Hipsters seem to love, and we chatted about dogs and their habits, and Katie, of course. She had an old powder blue typewiter inside, the “portable” type, so if anyone is looking for a typewriter, there is one there, just looking for someone to love it. Then I bought a Marysville Cookbook, which were put together to raise money to restore Marysville after those terrible fires we had in Victoria, I had been considering getting one for a while, but this gave me more of a reason, it’s not everyday that you get to meet the author. And though there was drizzle, we decided to walk to the local nursery, and while Ms Enigma liked the idea of plants and herbs, she told me that she couldn’t have them because of all the rabbits around her area, My sympathies, I have the same problem with snails, they won’t touch my feral lawn, but they love any special plant which tries and often fails to grow… baby sunflowers get gnawed to the soil at any sign of rain, I’ve given up. Anyway, it was a nice change, I enjoyed my day, and so did Katie, Who is flat out asleep now. Ms Enigma is another user of the internet who I’ve met and liked spending some of my time with, I can honestly say that I haven’t met anyone online who didn’t turn out to be nice in “Real Life”. Maybe I’m just a good judge of character? If you’d like more info on the Marysville Cookbook, you can read about it here. ps- Why do I hate the term “Real Life”? Because the internet is “Real Life” too, it’s not a fantasy land, it’s just an overblown version of the phone system. and I can prove it’s real life too… E-mail your boss and tell him/her where they can jam it, then turn up for work and see how far you get.